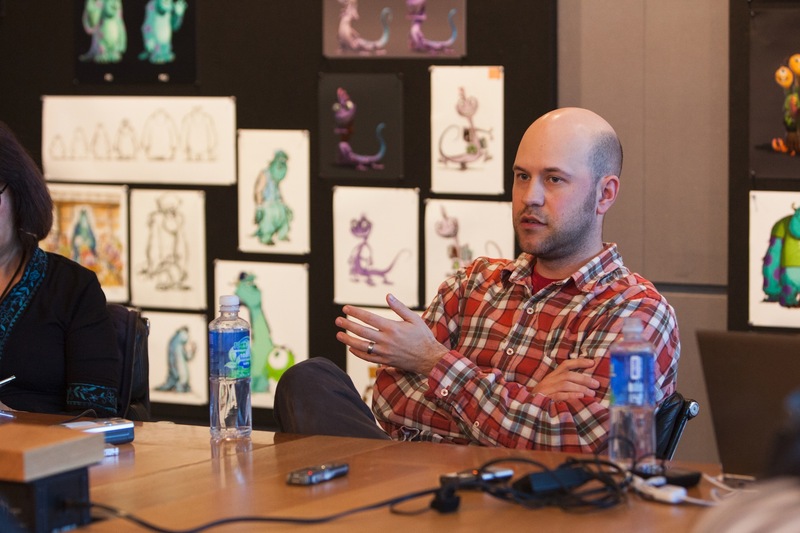 In early April, I was invited to visit Pixar to preview its upcoming films for the year, Monsters University and The Blue Umbrella, and to speak to the filmmakers that worked on them. 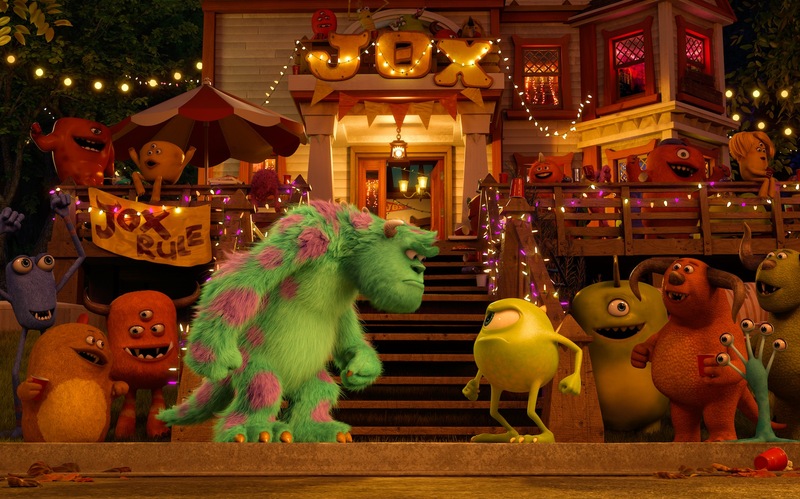 One of the concerns (translation: nitpicks) that some Monsters, Inc. fans had after the announcement of prequel Monsters University was the comment Mike made to Sulley in the original film that inferred they knew each other in the fourth grade. With the prequel film revolving around the story of how Mike and Sulley met in college, there was a vocal minority that complained about what seemed to be a contradiction. 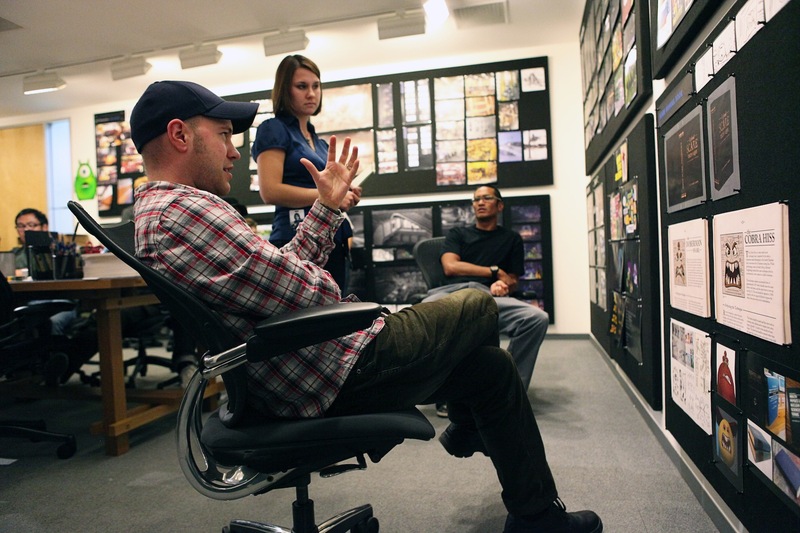 After the break, read what MU director Dan Scanlon had to say about that! As the video illustrates (a bit obnoxiously, I might add), in Monsters, Inc., Mike says to Sulley, “You’ve been jealous of my good looks since the fourth grade.” Scanlon told me that because of that line, early on in development, they considered a story where they did know each other during the fourth grade. They chose to set the film primarily during their college years because “so much of college is about self-discovery and figuring out who you are.” They still wanted to honor the fourth grade comment from the first film, so Scanlon and his team developed several different versions of the story where they met during their childhood and then the film jumped forward in time to their college years. However, Scanlon notes that with the time-jump between their childhood and college, “you sort of felt like you were missing [their] relationship grow.” Pete Docter, director of Monsters Inc., and studio CCO John Lasseter, spoke with Scanlon and told him that while making the franchise continuity an essential piece was honorable, he had “to do what [was] right for the story – do what [was] right for both stories in the long run.” They made a difficult decision, Scanlon says, and ultimately decided that having them meet in college was important, because then we could watch their relationship evolve on screen. The line still remains a part of Monsters, Inc., though. I would not count on the line being edited out of the film, George Lucas-style, as Scanlon has an explanation ready that maintains the integrity of that line. Stating that the fourth-grade line was originally put into the first film to show that the two had been friends for some time, Scanlon says that now the employees joke that “You’ve been jealous of my good looks since the fourth grade” is just a “monster expression” in that world. “That’s what monsters always say to each other,” Scanlon says sarcastically. Most importantly, the MU director says that when you watch the two films together, the spirit that runs through the prequel is loyal to the original film, and that is what they were looking to do. When the prequel film was first announced, I remembered briefly thinking about how the fourth grade line would be explained away. Pixar, a studio that thrives on consistency and attention to detail, would not throw away that line, I told myself. However, even before Scanlon explained what they did, I came to the understanding that it was just one sentence – while staying true to that comment would seem to pay tribute to that tiny line, Pixar is known for doing what it needs to tell a great story. If that means discounting that line, then so be it. If you find yourself waking in the middle of the night, in turmoil over how that quote was not given its due, tell yourself it’s a monster expression – it will help you get through the night. 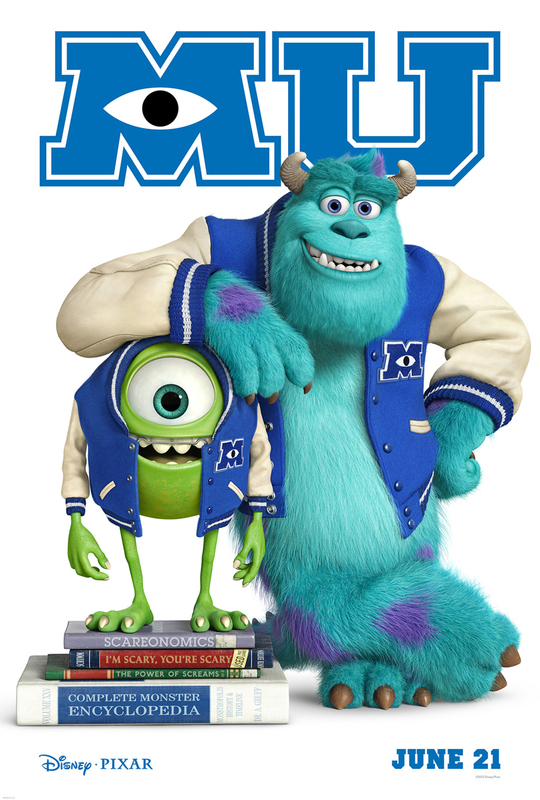 Monsters University arrives in theaters less than two months from now, on June 21. Before that, you can expect in-depth coverage from my trip to Pixar. This is only the launch of the coverage, so stay tuned for much more on the making of Monsters University and The Blue Umbrella.